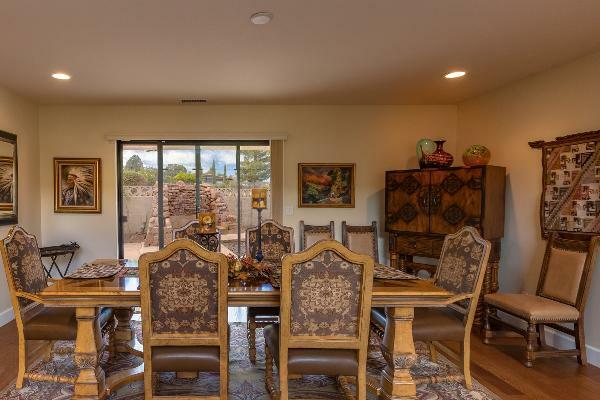 This elegant, newly renovated 3 bedroom, 3 bathroom home in Uptown Sedona boasts over 2,700 square feet of living and entertainment space, featuring stunning views of Snoopy Rock, and comfortably accommodating 7 guests. The first-floor bedroom offers two twin beds (which can be easily converted into a King upon your request) and adjacent bathroom for easy accessibility. 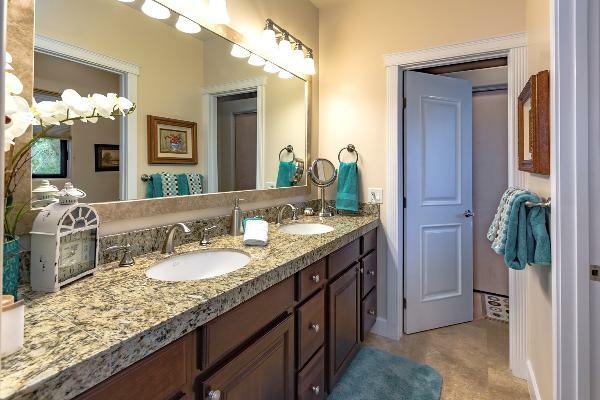 For your enjoyment, flat screen TVs are placed in all the bedrooms, the upstairs family room, and the living room. Complimentary Wi-Fi is available throughout the property. 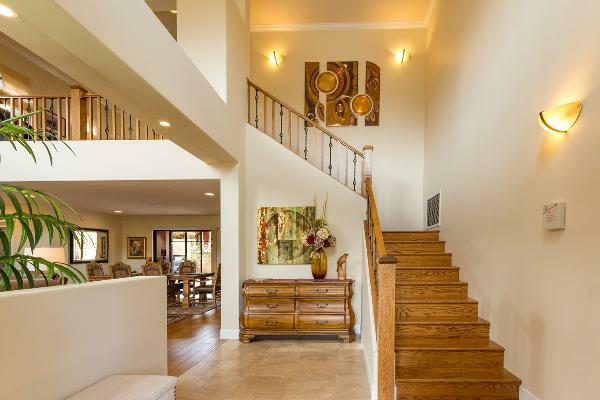 The open concept floor plan makes the living area spacious and enjoyable whether for a couple’s retreat, a small group, or family gathering. 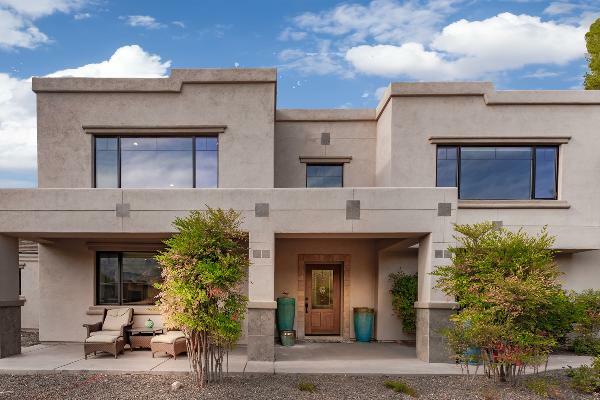 Entertain at home in our well-appointed gourmet kitchen, enjoy the views, and the Arizona weather on the beautifully landscaped backyard, complete with bocce ball court, fire pit, and a lovely water feature. 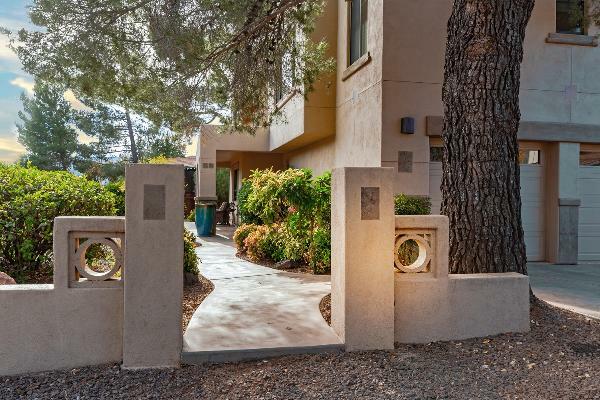 The tall trees surrounding the home give the feeling of seclusion and privacy, while remaining within walking distance to bustling Uptown Sedona. 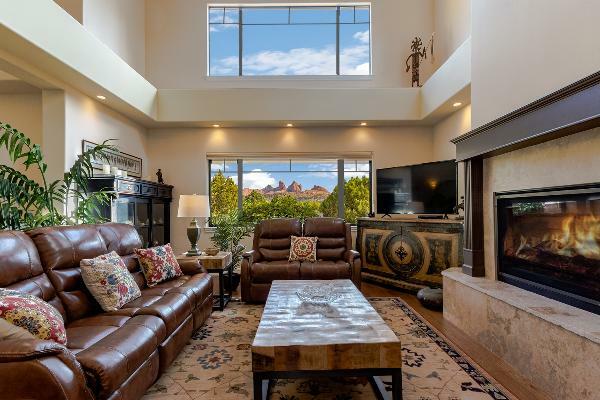 The home is conveniently located to art galleries, boutiques, a variety of restaurants, and of course, sightseeing, hiking, and biking. 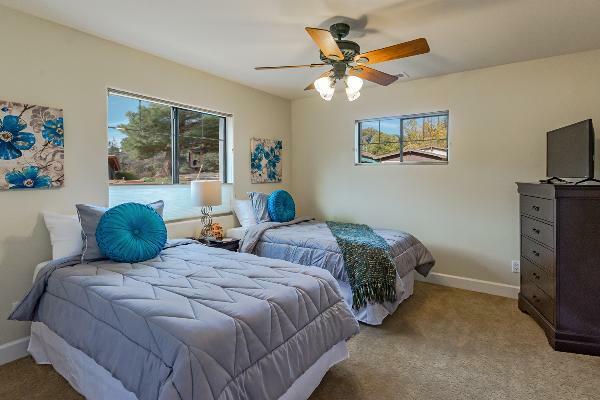 You are centrally close to everything Sedona has to offer. Please refer to our Visitor’s Brochure which highlights restaurants, outdoor activities, area attractions, state parks, and canyons. We provide crispy linens, luxury hotel standard bedding, and towels for all our guests, as well as bath products such as shampoo and body gel. A hair dryer is available in each bathroom. 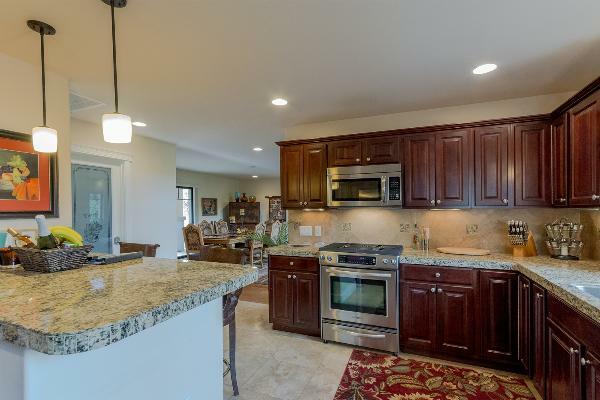 Your kitchen is stocked with all essential cooking equipment to prepare home-cooked meals. The owners have done it all to make sure that your stay not only meets your expectations, but exceeds them. Although Sedona has much to explore, you are only 2 hours from the Grand Canyon and 45 minutes from Flagstaff. Van Deren #2: Front Entry. Welcome!